mass of the accelerating object and the force that acts on it. If you're asking yourself what is acceleration, what is the acceleration formula or what are the units of acceleration, keep reading, and you'll learn how to find acceleration. Acceleration is strictly related to the motion of an object, and every moving object possesses specific energy. If you need to estimate it, visit our other calculators where you can find the kinetic energy formula, and it's angular version - the rotational kinetic energy formula. Acceleration always occurs whenever there is a non-zero net force acting on an object. You can feel it in an elevator when you become a little heavier (accelerating) or lighter (decelerating). Or when you're riding down the slope on your sled in the winter. What's more, from the general theory of relativity we know that the entire Universe is not only expanding, but it is even an accelerated expansion! That means that distance between two points is constantly becoming greater and greater, but we can't feel that on an everyday basis because every scale in the world expands too. Acceleration is the rate of change of speed of something; in other words, it's how fast the velocity changes. According to Newton's second law, acceleration is directly proportional to the resultant of all forces that act on an object and inversely proportional to its mass. It's all common sense - if several different forces are pushing an object, you need to work out what they add up to (they may be working in different directions), and then divide the resulting net force by your object's mass. This acceleration definition says that acceleration and force are, in fact, the same thing. When the force changes, acceleration changes too, but the magnitude of its change depends on the mass of an object. This is not true in a situation when mass also changes, e.g., in rocket thrust, where burnt propellants are exhausted from the rocket nozzle. If you wonder what is physics behind space travels, look at this Tsiolkovsky rocket equation. We can measure acceleration experienced by an object directly with an accelerometer. If you hang an object on the accelerometer, it will show a non-zero value. Why is that? Well, it's because of the gravitational force that acts on every particle that has mass. And where is a net force, there is an acceleration. An accelerometer at rest measures thus the acceleration of gravity which on the Earth surface is about 32.17 ft/s² (9.81 m/s²). In other words, this is an acceleration due to gravity that any object gains in free fall in a vacuum. Speaking of vacuum, have you ever watched Star Wars or another movie that takes place in space? The epic battles of spaceships, the sounds of blasters, engines and explosions. Well, it's a lie. Space is a vacuum, and no sound can be heard there (sound waves requires matter to propagate). Those battles should be soundless! To check the speed of sound in the air or water, try our speed of sound calculator. It even takes temperature into account! [if you choose #1] - Enter initial v_i and final v_f speeds of the object, and how much time Δt it took to change the speed. [if you choose #2] - Enter initial speed v_i, distance traveled Δd and time Δt passed during acceleration. Here, you don't need to know the final speed. [if you choose #3] - Enter mass m of the object and the net force F acting on this object. This is an entirely different set of variables that arises from the Newton's second law of motion (another definition of acceleration). Read the resulting acceleration from the last field. You can also perform calculations in the other way if you know what is acceleration, for example, to estimate distance Δd. Just provide the rest of the parameters in this window. Knowing what is acceleration is essential in analyzing the motion of objects. For example, you can find what is the momentum change in a certain time with this formula for momentum. This is a physical quantity we use in our car crash calculator where we explain and visualize the importance of seat belts using numbers, and determine at what speed can you die in a car crash. Speeding and alcohol content in blood are examples of the top causes of car accidents. Please, drive carefully! In the 17th century, Sir Isaac Newton, one of the most influential scientists of all time, published his famous book Principia. He formulated there the law of universal gravitation which states that every two mass objects attract each other with the force that has an exponential dependence on distance between these objects (specifically, it is inversely proportional to the distance squared). The heavier the objects are, the greater is gravitational force. It explains, for example, why planets orbit around the very dense Sun. m is the mass of this object. Now you know how to calculate acceleration! In the next paragraph, we discuss the units of acceleration (SI and British). Have you already seen our conversion calculators? They might save a lot of time when dealing with various units. In case of distance, you may be interested in the length converter with the length conversion table, and if you want to switch between different units of mass, here's our weight converter. Both calculators allow you to perform calculations quickly with any set of units you want. Give them a try! If you already know how to calculate acceleration let's focus on the units of acceleration. You can derive them from the equations we listed above. You surely know that speed is expressed in feet per second (imperial/US system) or meters per second (SI system) and time in seconds. Therefore, if you divide speed by time (as we do in the first acceleration formula), you'll get acceleration unit ft/s² or m/s² depending on which system you use. Alternatively, you can use the third equation. In this case, you need to divide force (poundals in US and newtons in SI) by mass (pounds in US and kilograms in SI) obtaining pdl/lb or N/kg. It's basically the same thing since poundal is pdl = lb * ft/s² and the newton is N = kg * m/s². When you substitute it and reduce the units, you'll get (lb * ft/s²) / lb = ft/s² or (kg * m/s²) / kg = m/s². There is also a third option that is, in fact, widely used. You can express acceleration by standard acceleration due to gravity near the surface of the Earth which is defined as g = 31.17405 ft/s² = 9.80665 m/s². For example, if you say that an elevator is moving upwards with the acceleration of 0.2g, it means that it accelerates with about 6.2 ft/s² or 2 m/s². We rounded the above expressions to the two significant figures under the significant figures rules that you can find in our math category. Generally, acceleration is a vector so you can always decompose it into components. Usually, we have two parts that are perpendicular to each other: centripetal and tangential. Centripetal acceleration changes the direction of the velocity, and therefore the shape of the track, but doesn't affect the value of the velocity. On the other hand, tangential acceleration is always perpendicular to the trajectory of motion. It is in charge of changing the value of velocity only and not its direction. In a circular motion (below picture on the left), where an object moves around the circumference of a circle, there is only the centripetal component. Object keeps its speed at a constant value like the Earth that has centripetal acceleration due to gravity of the Sun (in fact its speed changes a bit during a year - see orbital velocity calculator and orbital period calculator for more information). When there are both components, the object's trajectory looks like on the right picture. What happens if there is only tangential acceleration? This is a case of linear motion, for example, when you press a gas pedal in a car on a straight part of the freeway. And if you're a driver, our gas calculator might be of interest to you as well. It estimates the cost of car travel. You provide fuel economy, distance, gas price and you'll get the cost of the trip that you may even split with a few people. Traveling together is fun and beneficial! A group of talkative friends in your car will, e.g., prevent you from falling asleep. Angular acceleration plays a vital role in the description of rotational motion. However, don't confuse it with the previously mentioned centripetal or tangential accelerations. This physical quantity corresponds to the rate of change of angular velocity. In other words, it tells you how fast do an object's rotations accelerate - object spins faster and faster (or slower and slower if angular acceleration is less than zero). Did you know that we can find an analogy of Newton's law of dynamics in rotational motion? Particularly, in his second law, you can switch acceleration with angular acceleration, force with torque and mass with moment of inertia. You might notice that some physical laws, like this one, are universal and that makes them really important in physics. We talked about acceleration due to gravity a few times earlier. It arises from the gravitational force that exists between every two objects that have masses (note that gravity equation doesn't have objects' volume dependence - only masses are essential here). It may sound weird at first, but according to the third Newton's law of motion, you act with the same force on the Earth as the Earth acts on you. However, the mass of the Earth is much bigger than a human mass (~10²² times bigger) and therefore it doesn't even feel that we live there. It's like with the bacterias (~10¹⁸ times lighter than a human) living on your hand, you can't even notice them! On the other hand, we can feel the influence of our planet, and that's acceleration by gravity. Standard gravity is by definition 31.17405 ft/s² (9.80665 m/s²), so if a human weighs 220 lb (about 100 kg), he is subjected to the gravitational force of about 7000 pdl (1000 N). Let's enter this value to #3 window of our calculator but with the mass of the Earth 1.317 × 10^²⁵ lbs or 5.972 × 10^²⁴ kg, written with the scientific notation rules (there are many zeros, we know). What is the calculated acceleration? It is so small that our calculator considers it like a zero. We mean nothing compared to the planet! We were talking about huge objects in space. Now, let's move to the microscopic world of particles. Although we can't see them with our eyes, we use high energy particles, like electrons and protons, in particle accelerators in physics and medicine. They can destroy cancer cells while sparing surrounding healthy tissue or investigate material structure at the atomic scale. Recently, cancer is one of the diseases of affluence that probably result from the increasing wealth in society. Even poor nutrition can increase the risk of cancer! With this daily protein calculator you can check how much protein do you need a day and if also want to get fit, our macro calculator is here to help you. You probably heard about The Large Hadron Collider (CERN) which is the most powerful particle accelerator in the world. It allows us to take a step further to understand how the universe works and develop technologies that may have many essential applications in the future. However, to achieve such high energies, we have to accelerate particles to the speeds that are close to the speed of light. Briefly, we can do it using magnetic or electric fields. 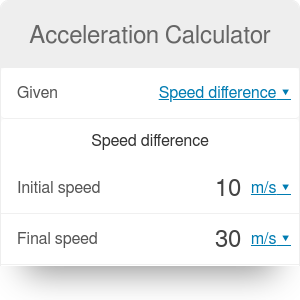 To see how incredibly fast do particles accelerate compared to the standard gravity, check out our acceleration in the electric field calculator where we explained how to calculate the acceleration of charged particles. The world of an enormous number of microscopic particles is ruled by the statistical physics that focuses on the concept of probability. We've got many calculators related to this topic. Take a look on the probability calculator to learn how to find probability or try permutation calculator to determine the number of ways in which you can order a certain amount of elements. Physicists use permutation to predict theoretical material properties that can be then observed in everyday life. For example, you can find out what is the average velocity of gas particles. Acceleration Calculator can be embedded on your website to enrich the content you wrote and make it easier for your visitors to understand your message.